We are a proud sponsor of the Local Motive, a collaboration between The Skinny Pancake and Vermont PBS that explores the Vermont food system in a six-part series. The series launched this past Thursday and a new episode will be aired each week on Vermont PBS. Watch an episode tonight at 7pm on Vermont PBS Plus. Recently, I was able to visit some of UVM Dining’s local partners in the Burlington area. 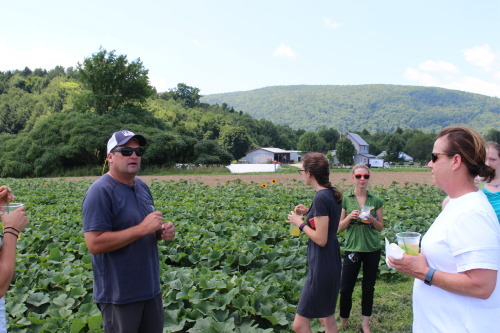 Our first stop was Rockville Market Farm, located on a beautiful stretch of land in Starksboro. Upon arrival, we were invited to try some of their famous maple lemonade. Aside from being a perfect refresher on a hot day, this drink is actually the largest source of income for the farm. Every weekend during the growing season, Eric and other crew members make the drive down to NYC to set up a stand at the famous Smorgasburg market in Brooklyn, an event they have been participating in for years that draws some unique and well-loved vendors from all over New York and New England. However, there is a lot more being produced at Rockville Market Farm besides their lemonade. 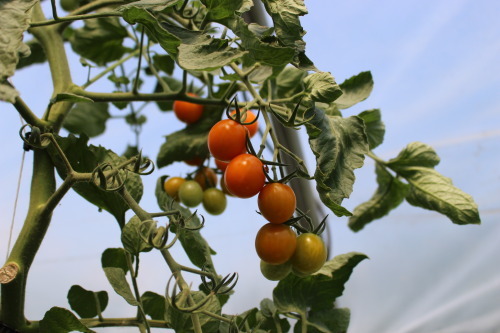 The organic farm produces tomatoes, squash, onions, corn and more for their CSA shares, farmer’s market stands and wholesale orders. Their produce is also included in CSA shares through the Intervale Food Hub. 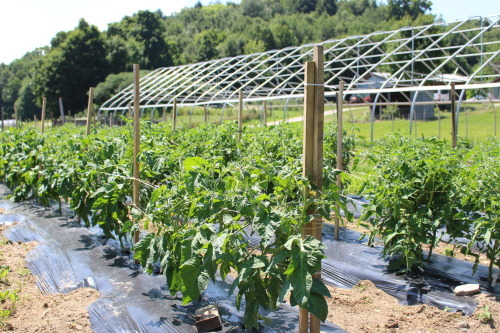 Rockville Market Farm’s relationship with the Intervale started five years before they made the move to Starksboro, as the farm took its roots there before they were able to purchase their current land from the Vermont Land Trust. This is a great example of the success that can come from a supported start from the Intervale Center, parent organization of UVM’s newest produce distributor,Intervale Food Hub that brings Eric’s peeled butternut squash to campus. 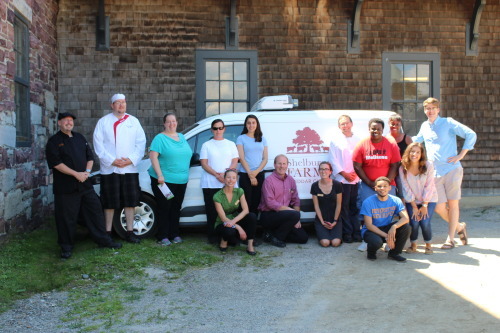 There never seems to be a dull moment at Shelburne Farms, from their cheesemaking facility to the market garden education and sustainability drives the work they do. When we arrived, Rory, the cheese sales manager gave us a brief history of the estate and the different operations that run throughout the year. Our focus was on their most well-loved product, Shelburne Farms cheddar. 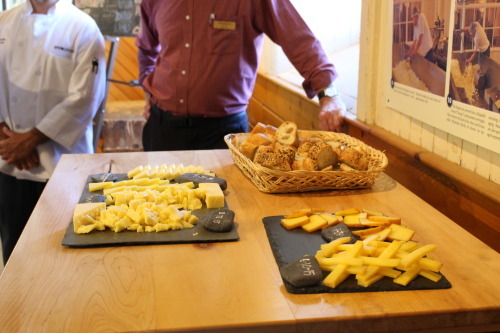 We were talked through a cheddar tasting with six different types and given tips on how to get the most flavor from the cheese, for example holding the cheddar between your fingers for a minute to warm and soften it makes for an even richer bite. We were encouraged to share flavor notes as we tasted the cheeses with beef broth and onions coming up for the savory two year aged cheddar. 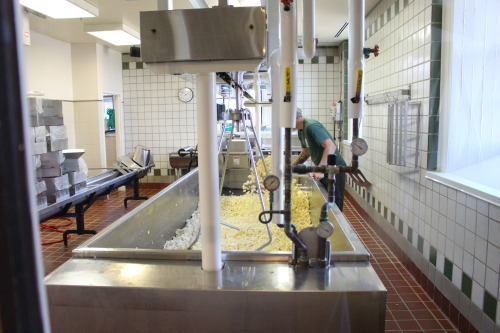 The cheesemaking facility is set up so that farm guests can watch the production from start to finish. The milk from the farm’s herd of Brown Swiss cows is piped directly into a large vat where the cheddaring process begins. Through a series of steps, the cheese begins to form until it is firm enough to cut into large blocks. At this point, they are stacked repeatedly in a way that is unique to creating cheddar. After this, the blocks are cut into curds before the aging process begins. Shelburne Farms is unique in that they completely transparent with their cheese production process and recipes. They are an educational center with the main goal to share the traditional cheddaring process and historical culture of cheese making with visitors and are more than happy to answer questions and talk all things cheese! To end this delicious visit, we were each given a block of the two year cheddar to take home and savor. If you haven’t tried Shelburne Farm’s award winningcheddar, look for it on menus across campus to get a taste of this Vermont staple. 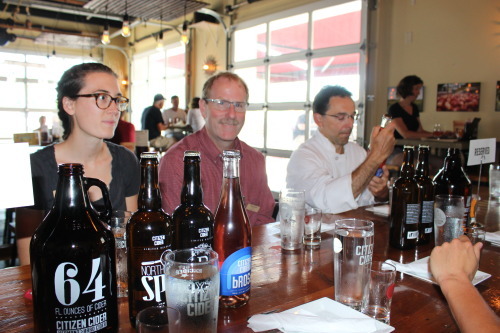 The last stop on the tour allowed us to cool off with a tasting of Burlington’s own Citizen Cider. 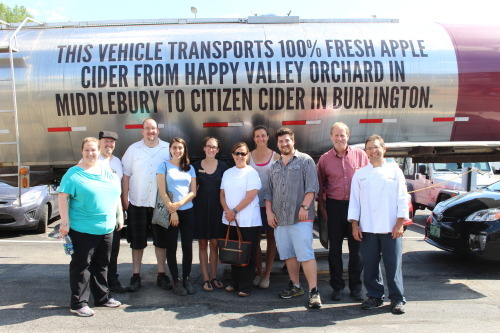 UVM purchases the hard cider for catering events and hopes to bring their non-alcoholic cider, Citizen Sweet, to campus as Citizen Cider scales up their production. 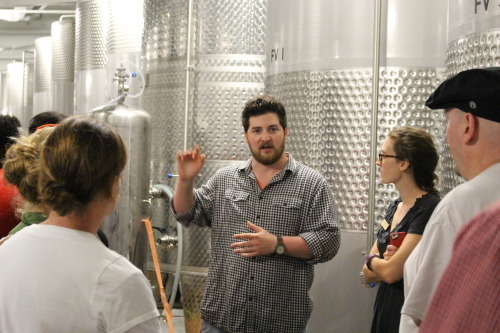 The business has steadily grown over the past couple of years since 2011 and they have moved from large plastic containers full of cider to state of the art tanks. The market for local, natural cider is growing and Citizen Cider has risen to the top of the market in Vermont. As our tour leader Jordan said, “Five years ago if I ordered a cider at a bar, my friends would have laughed at me. Now retired men and 21-year-old women can drink the same cider and no one bats an eye. I think that is success!” They continue to experiment with new flavors and product ideas, a complex process that we were able to catch a glimpse of as we walked through the production area. For example, their Homesteader Cider came about after inviting locals to bring apples from their farms and properties that would be turned into a specialty cider and put on tap for a limited time for people to enjoy knowing that their apples were a part of the mix. What a commitment to local sourcing! All apples used to make the cider are local (within 200 miles) and come from Vermont and New York. They use a variety of apples, many of which are not traditionally sold in grocery stores. For instance the Northern Spy apple, an heirloom variety that is solely used to make their Northern Spy Cider. Along with this cider, our group tasted the B-Cider which uses local honey as natural flavoring, but is not as sweet as you would think. Lasty, the Brosé which is infused with blueberries, no added sugar or coloring and has a similar light taste to rosé. This name came from the three men who started Citizen Cider with the goal of elevating hard cider’s reputation in the alcohol world. They recognized that cider was one of the libations that never bounced back after prohibition. To do this, they wanted to make a local cider that was not overly sweet due to added sugars, would align with Vermont’s exploding craft beer industry, and have the added appeal of terroir.